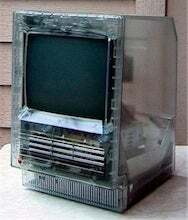 If someone were to ask you, “What Macs were the first to feature transparent plastic cases,” no one would blame you for answering, with confidence, “Why, the iMac, of course!” Sadly, you would be mistaken. Before you ask: No you can’t buy this clear SE but you can buy a nice print of it to decorate your office wall and mystify your fellow Mac geek friends. The poster costs $19.95 but learning a little tidbit of Apple history is priceless.